Karl Moline’s artwork in Fray is exemplary, striking the perfect balance between realism and imagination. The characters and settings are realistic enough to be living, breathing entities, but cartoonish enough to take advantage of the medium’s inherent ability to disregard the laws of physics and biology. 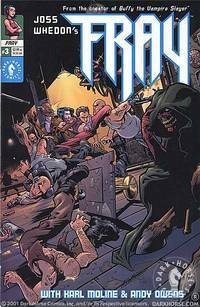 Fray is colorful without being gaudy; it’s detailed, without a confusing melding of foreground and background; it’s dynamic, without the cliched contortions common to superhero comics; and its layouts are practical, the size and shape of the panels varying only when it serves the story. Too bad for Moline that Fray was written by Joss Whedon. As the creator of Buffy, Angel, and Firefly, Whedon’s name and his writing enviably steal the spotlight. 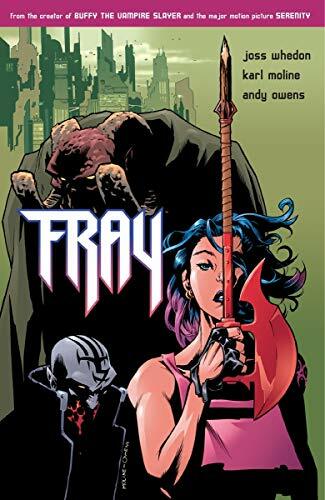 Fray takes place in the Buffyverse — the term for Whedon’s mythology consisting of slayers and their watchers — though it’s set 200 years into the future. It blends elements of science fiction, fantasy, and horror seamlessly, demonstrating how restrictive those terms are and how unnecessary it is to make such distinctions. Suffice to say that the story includes ray guns, vampires, flying cars, and demons. In Fray, Whedon uses some of the conventions of myth-making. There’s a young orphan (Frodo, Luke Skywalker, Harry Potter), who is plucked out of obscurity by a mentor (Gandalf, Obi-Wan), to fulfill a destiny ("You’re a wizard, Harry"). She is aided by a special weapon (Sting, "your father’s light sabre"). And there’s even a second-in-command (Saruman, Darth Vader) who does the dirty work of the main villain (Sauron, Emperor Palpatine). Yet Whedon avoids being predictable, adding his own twists to keep the material fresh. Fray opens with parentless thief Melaka Fray pulling a job for a an amphibious creature named Gunther. She is soon recruited by a watcher, Urkonn, to take on her role as the new Slayer. She is given a special weapon, a combination scythe/stake, to use against vampires and demons. Eventually, she battles Icarus, a lurk (the term "vampire" has been forgotten in the intervening centuries) who works for an even more powerful villain. Writer David Brin has lamented over the anti-egalitarian perspective that still resides in genre fiction. Buffy originally adapted this creatively lazy, pro-elite stance. Buffy was simply the Chosen One. She had a destiny that was directed by the patriarchal Watchers, a council that acted without any input from society. During the TV show’s seven year run, Buffy rejected both her watcher and the Council itself. While this move did take power away from a self-appointed group that operated without the public’s knowledge, it further concentrated that power within one individual, one who increasingly equated her uniqueness with superiority. In the end, however, there was a major thematic reversal: Buffy shared her power with other potential slayers. The series ended with the understanding that women would chose their paths instead of having those paths bestowed upon them. While reinterpreting older stories to suit new generations can be risky, tweaking an original creation has its own potential pitfalls. Modern world builders, like JRR Tolkein, Frank Herbert, and George Lucas, have to deal with the pressure of maintaining internal consistency, an artistic responsibility the various contributors to, say, the King Arthur legend never had to worry about. But Whedon is careful not to present any contradictions that damage his carefully constructed Buffyverse. 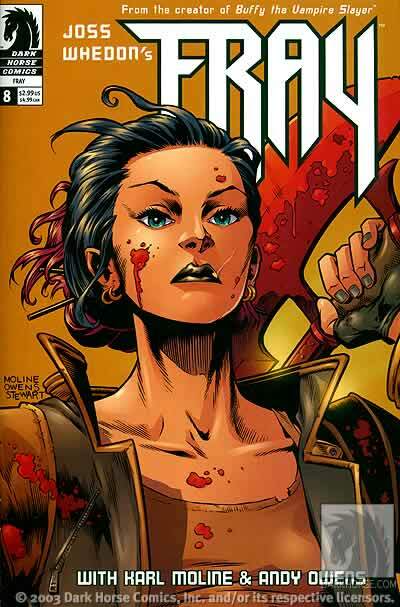 When Melaka Fray becomes the Slayer, it’s a reactivation of the ancient line that had apparently ended with Buffy. Initially, this setup feels like both a narrative shortcut and a thematic step backwards. But as the story unfolds, it becomes clear that no cop-out reversals are forthcoming. The Council barely warrants a mention, while Fray’s own watcher is out of the picture by the end of the story. Whedon doesn’t allow the elitist infrastructure to reassert itself. Even the very concept of the Chosen One takes a hit right from the beginning. Born as a twin, Fray ends up with only part of a slayer’s powers: the strength. Furthermore, while Buffy grew increasingly detached from her friends, Fray goes in the opposite direction. The story begins with her estranged from her sister Erin, but Fray grows closer to her and eventually teams up with her for the climatic battle. Having greatly reduced the "inherently better" factor, Whedon then includes a scene in which Fray enlists the help of the community she is trying to protect. By the end, Fray is a hero among many, with only extraordinary physical strength to distinguish her. Whedon has left room for a sequel to Fray. The main villain escapes, and there are two behind-the-scenes demons whose agendas merit further exploration. But an interesting challenge for Whedon would be to continue on with a stripped down hero, one who has shed most of what constitutes being a slayer.